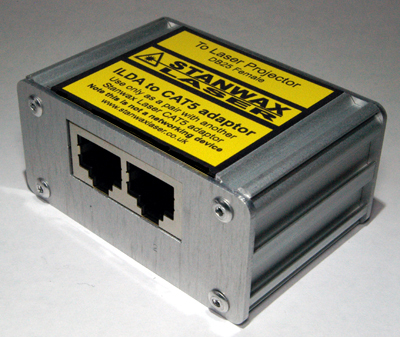 Stanwax Laser ILDA to CAT 5 adaptors allow 1 ILDA signal to run from the laser projector to the control station using CAT 5 cables or CAT 5 infrastructure as long as it does not pass through a switch. It connects the most common signals using 2 CAT 5 cables and is sold as a matched pair. NOTE THIS IS NOT A NETWORKING DEVICE. The pack contains 1x dual RJ45 to DB25 Male and 1 x dual RJ45 to DB25 female housed in anodised extruded aluminium housings. 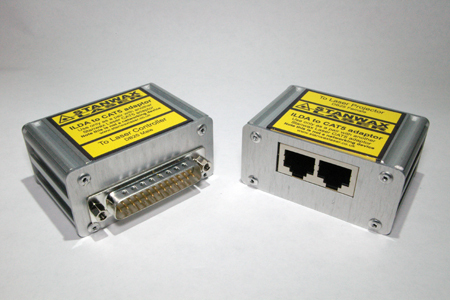 The data ports are marked for ease of connection and the uints are a compact size at 64x30x50mm including the connectors. 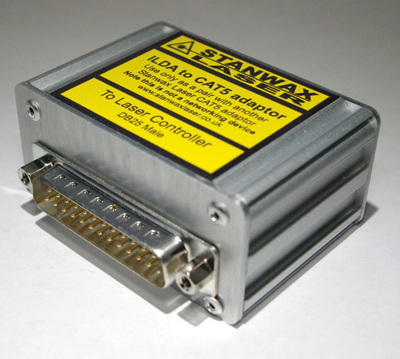 Stanwax Laser ILDA to CAT 5 adaptor will pass differential signals for X,Y, R, G,B plus ground ILDA interlock, and Shutter, plus it has provision for the start button signal as used on Stanwax Laser ILDA interface boards making it compatible with using this interface in your laser projector. We are often asked about the length of cable run possible with these adaptors - We answer that it depends on the quality of the cable used however we have used them with cheap cat 5 cable in a length of 240 metres with no problems. Great advice, delivered exactly when expected. Thanks a lot your adapters have saved me a lot of grief. Great service from Rob as always, quick response & shipping of the item. The product itself is such a saver for us and a great build, simple, effective and robust... for those wanting to do a large run from their DACs without spending the earth on long ILDA cables or Network options then this is a must! Very very good solution for big event, when U need many meters of cable!!! Net cable is more cheap of Ilda and more light to transport. I use this interface for my biggest events with over 100 meters of net cable and they work perfectly. In my last project I had installed directly in a laser housing so I could plug and link only with net cable. Good work Rob!!! Durable aluminium construction which will survive the usual knocks and bumps during installation or derigging. A cost effective way of getting ILDA signals over CAT5 cables (or CAT5 infrastructure). You will require 2 short 25pin ILDA cables to connect the controller & laser to the adaptors. Cracking product.